Tourmaline gemstone is a semi-precious mineral similar to granite. With colors ranging from magenta to teal-blue, meadow-green to vibrant yellow, and even black, tourmaline gets its name from the Singhalese phrase “tura mali,” which means, “stone mixed with vibrant colors.” It’s believed that no two tourmaline stones have the exact same color and it’s historically revered as a “magic” stone that is capable of protecting whoever wore it. Although it might be a stretch to say tourmaline has supernatural powers, it does have the uncommon and very special ability to generate an electric charge and emit negative ions and far infrared rays. Sandalwood is one of the most valuable woods in the world. All parts of the sandalwood tree, particularly the heartwood and the roots, yield sandalwood oil. Sandalwood is a highly sacred tree that grows in India and is used in rituals throughout the country. With its sweet woody scent, sandalwood and its oils are in huge demand, for its uses are vast included in the making of perfumes, soaps, candles, beauty creams and furniture. However, growing demand is pushing the tree towards extinction in its native India. Around 70% of India’s sandalwood comes from the state of Karnataka, where sandalwood plants take around 35 years to develop into fully-grown trees. 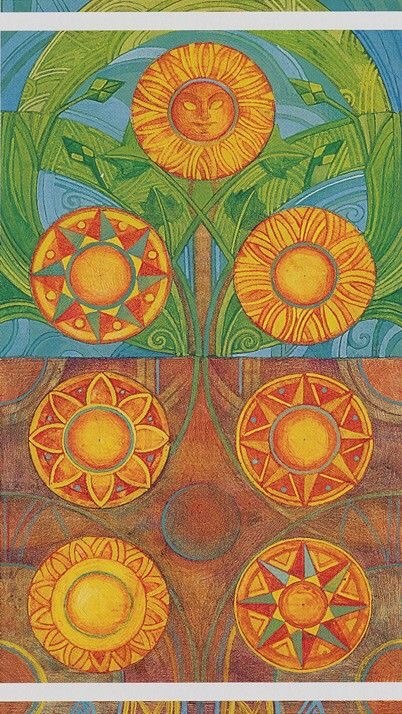 How appropriate for the 7 of Pentacles; we could use some time to determine our course. “This is a time of assessment, and hard work, as you determine what it takes to get this big transition of yours underway. It does not appear to be time to reap the harvest, but rather to give careful consideration to cultivating all of your current options.” And as you mentioned, a time of reflection during this full moon. Full Moon blessings to all! Today is the Full Moon in Sagittarius (Bonus Video included below from my Patreon Creator page), and I find the timing of this 7 of Pentacles to be very interesting. This is a time of assessment, and hard work, as you determine what it takes to get this big transition of yours underway. It does not appear to be time to reap the harvest, but rather to give careful consideration to cultivating all of your current options. Good information to know your direction. RUNE OF THE MONTH: Ehwaz “Horse”. A month of profound changes. By letting go of too intense an attachment to the mundane, we can feel and express our freedom. If we have wanted to create new things in our lives (move, start a different job, take up a hobby…) now is the time to fully commit to bringing these projects into manifestation. A month of personal empowerment by banking on our talents and acting on our visions!